and celebrates CREATIVE COMMUNITY building. and beautiful Central Frederick, Kitchener. 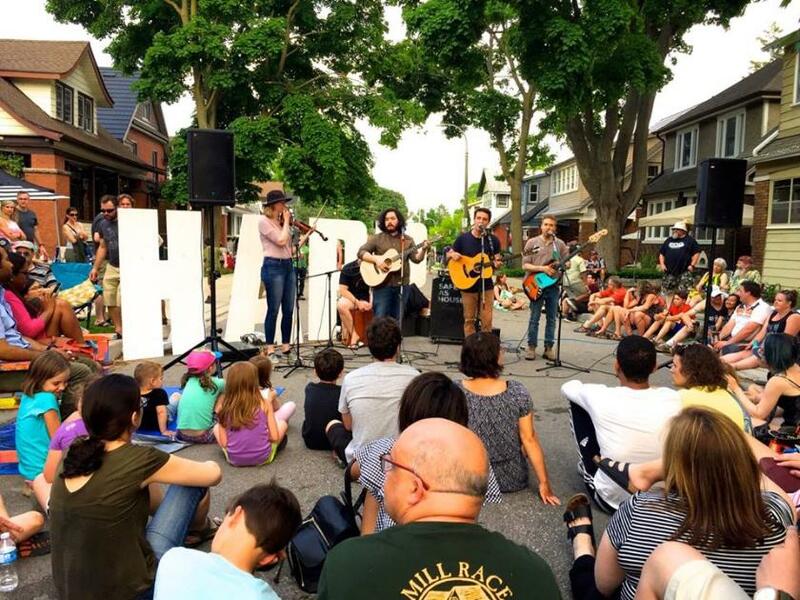 THE HOHNER AVE PORCH PARTY (HAPP) ATTRACTS PERFORMERS OF EVERY AGE, GENRE, AND EXPERIENCE; FROM SCHOOL CHOIRS AND GARAGE BANDS TO FINE TUNED PROFESSIONALS. EVERY YEAR WE ARE BLOWN AWAY BY THE SUPPORT OF LOCAL MUSICIANS. IT'S JUST AN AMAZING TESTAMENT TO HOW PEOPLE CAN BUILD GOOD THINGS TOGETHER. EVERY YEAR OUR FESTIVAL STRIVES TO STAY LITTLE BUT THINK BIG. Hohner Avenue will be closed for the event. 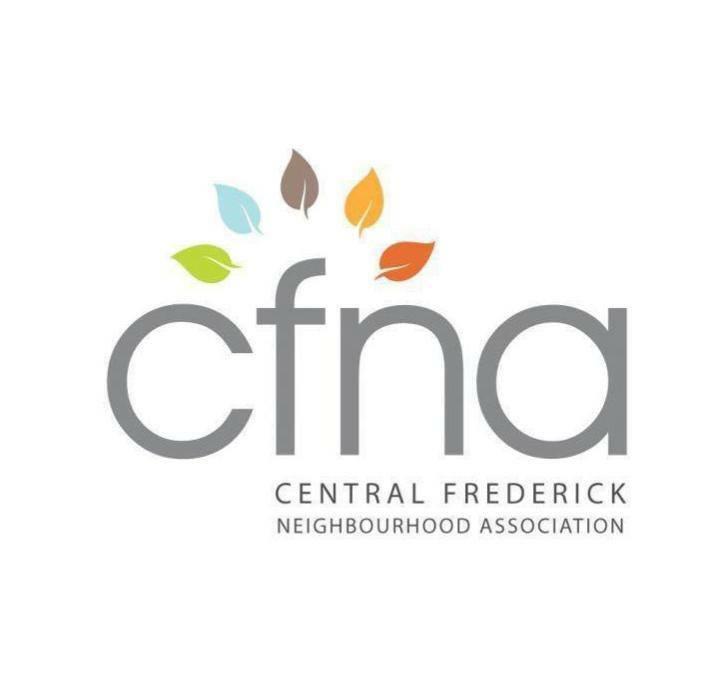 We will close the street to vehicle traffic at 1:00PM, and we ask residents of Hohner Ave that require their vehicle between the hours of 2:00PM to 10:00PM to please attempt to find street parking on a neighbouring street before 2:00PM. Parking is available on neighbouring streets, Bethany, or at the Kitchener Market which are only a short walk away from Hohner Ave. There will be a quick drop off area at the Samuel end of Hohner Avenue that people and musicians can take advantage of. Bread Heads is back with their wood fired pizza that so many people rave about every year. We love Bread Heads because, not only do they support festivals with their food truck but they have a brick and mortar nearby on the Duke Food Block. B @ the Museum are supporting local flavour and music from their brick and mortar at the Museum on King Street, and will have their food truck at HAPP bringing us amazing food. Speaking of SWEET, we're excited to welcome Four All Ice Cream to the party! 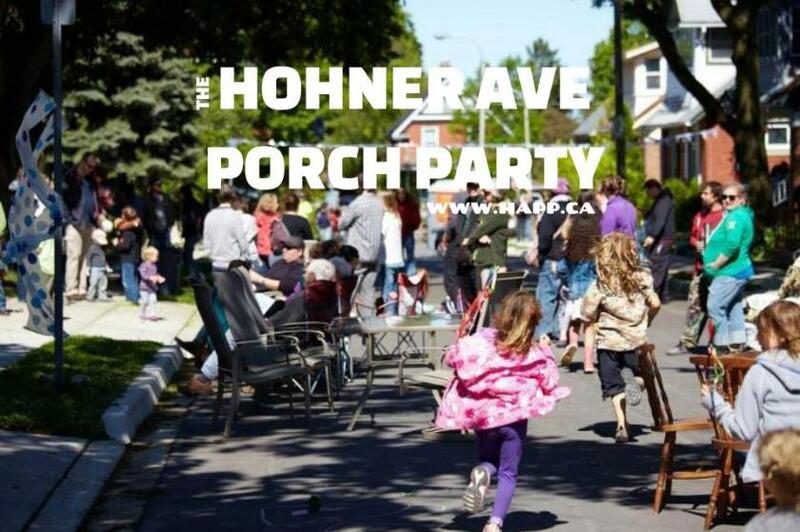 The Hohner Porch Party is a Family Friendly event, and we would like to remind you that it is illegal to have open alcohol on the streets at any time. 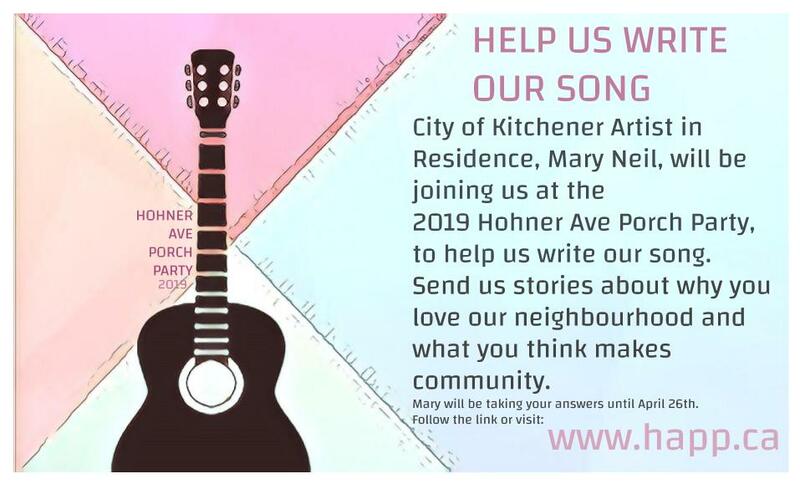 The residents of Hohner Ave have graciously allowed us to host a public event on their street, please respect that awesome gesture by keeping the street clean. There will be a wheelchair accessible Port-a-Potty located on Hohner Avenue during the event for public use. Please remember that this is a family event, and please try to keep the provided washrooms clean. Special THANKS to the City of Kitchener for helping fund this awesome festival. 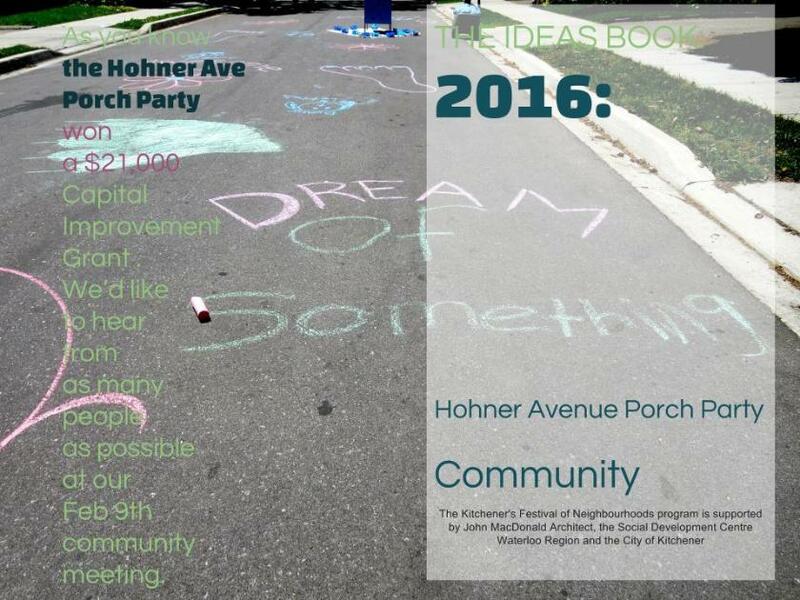 Inspired by the great Central Frederick Neighbourhood Association (CFNA) tradition of community events, the number of artists and performers in the neighbourhood, and the success of a Waterloo-based Porch Party, members of CFNA came together to plan the first Hohner Avenue Porch Party in 2013. This event was a great success, so we decided to keep going and see where it takes us!